Seven in a row. It doesn’t even sound right, to be truly honest. I’ve never been around a football team that ever won seven in a row. Not in high school. Certainly not in college where we won six games in four years. Not as a high school coach. Not in my first four years with the Texans. No one saw that coming. How could you? No NFL team in the Super Bowl era had ever lost three to start the season and then won seven in a row. No NFL team since the 1925, the leather helmet era, had won seven after three losses. Yet, here we are with three home games in a row. Time to make the donuts. Here are my observations from the win over Washington. 1. The tone of the game was set on the first play of the game. The Redskins put a bunch formation out to his right and quarterback Alex Smith threw a quick screen to his Pro Bowl tight end Jordan Reed. As soon as the ball his hands, Kareem Jackson was right in his lap, knocking the ball away with a stout hit. 2. Boy, running back Lamar Miller ran his guts out on Sunday. He pounded out 86 yards on 20 carries as his offensive line took on some water, if you will, due to injuries to both starting guards. He was patient and explosive through the holes. The Redskins were fifth in the NFL in rush defense, giving up just over 90 yards per game. After the Texans piled up 139 yards on 31 carries, the Redskins moved down to seventh. Miller and Alfred Blue came up with big runs throughout the day. Really, the only time that the Redskins truly stopped either back was when they knew that the Texans were going to run late in the fourth quarter. 3. The offensive line took a hit during the day with both starting guards going down in the game - Senio Kelemete and Zach Fulton. From the middle of the second quarter on, they had no more offensive linemen available. Regardless, Martinas Rankin and Greg Mancz did yeoman’s work in the run game, in particular. Rankin had a key block on a hugely important Lamar Miller run in the second quarter. The Texans were buried back at their five yard line when on first down, Deshaun Watson handed to Miller who followed his pulling left guard over to the right side for a key 21 yard gain. 4. Then, on the go-ahead field goal drive in the fourth quarter, it was Alfred Blue’s two key runs that took the ball from the Texans 41-yard line to the Washington 37-yard line. On 2nd and four, he hammered for six yards and then on the next play, he sped around the left side for 16. On the day, Blue averaged 5.8 yards per carry on eight carries and continued to impact this offense. 5. On that drive, the Texans had a block in the back that moved the ball back to the Washington 47-yard line. The Texans faced 3rd and 20, but more importantly, they were now out of field goal range. But, with Washington dropping nearly everyone in coverage, Deshaun Watson dumped off to Jordan Thomas who picked up 11 yards. It was certainly not enough for the first down, but was just enough to give Kaimi Fairbairn a shot at a field goal. He nailed the 54-yarder on the next play. 6. One massive aspect to the entire game was that the Texans defense forced a three and out after their first interception of the game. Any points after that first pick and this Texans team would have flown home a 6-4 team instead of 7-3. 7. The Texans lost the turnover battle for the first time in the seven game winning streak, yet walked away with a win, on the road, at an NFC opponent that was (and still is) in first place. Read that again and then consider that the Texans hadn’t beaten an NFC team on the road since Thanksgiving…2012. A little more impressive, maybe? 8. Love, LOVE the 3rd and one call on the first drive. The Texans had third and short and showed run action but instead of blocking linebacker Mason Foster, tight end Jordan Akins shot to the flat wide open for a huge 28-yard gain. That was really the key on that opening scoring drive. 9. The play of the game had to be rookie Justin Reid’s 101-yard pick six. Down on the field, I could sense the team had lost its early juice. The offense slowed down after a hot start and seemed to lose some momentum. The defense gave up some key plays on what looked like a sure scoring drive. Then, Reid struck. But, that’s how this season has gone. How do you explain a quarterback (Alex Smith) nearly allergic to interceptions throwing one, down inside the ten? Then, said interception going for six the other way? The entire sideline got a jolt from that play and not just because of the score. Yes, obviously a ten or 14-point swing will do that but I just saw such a revived sideline. 10. That said, Reid was in the perfect spot as he’s been since he was inserted into the starting lineup earlier this year. He said after the fourth preseason game that he’d never had a pick six and he really wanted one. Well, there ya go, young buck, you had to work for it, though. 101 yards, which I thought was a record, but my pal Marcus Coleman had one for 102 yards back in the early 2000s. So, quick and heartfelt apology to Marcus as I tried to give that record to Justin. Either way, Reid made plays all game long. The one that won’t be mentioned often was the pass breakup on the final drive. He went over to help on receiver Josh Doctson and saw an opportunity to get the rock again. Thankfully, he aggressively went after the ball because Doctson almost came up with it. But, Reid made sure that he didn’t. 11. Also, on the pick six, I was right around the ten yard line, so when Justin sped past me, I reflexively looked back to make sure there were no flags behind the play. When I did that, Tyrann Mathieu was in the end zone losing his mind. He dropped to both knees and then got up with so much juice and slammed his helmet down in pure ecstasy. It was pure, unadulterated joy. His pal, teammate, safety partner had just changed the game and Mathieu was beyond pumped for him and his team. It was really cool to see him so hyped. 12. That pass breakup forced Washington head coach Jay Gruden into a decision. There were eight seconds left and it was fourth down. To get another play, they probably didn’t have enough time to get ten yards, spike it and kick the field goal. That’s why that Reid breakup was huge. So, Gruden decided to let his kicker Dustin Hopkins attempt a 63-yard field goal, into a slight wind. He hit it straight but was probably seven or eight yards short. 13. In the future, people will ask me about this streak, this team and certain names will come to mind. For me, one that I’ll remember is Brennan Scarlett. With J.J. Watt and Whitney Mercilus back from injury and Duke Ejiofor drafted, it didn’t appear as if there would be a ton of defensive reps for Scarlett in 2018, but that never derailed him. He jumped on special teams and found a way to impact this team. He has been one of the best on teams’ units throughout this campaign. Then, in the Miami game, inside linebacker Zach Cunningham got hurt and that position’s depth was stretched pretty thin with Brian Peters already out. So, along with Josh Keyes, Scarlett stepped in at inside linebacker and showed some promise. Since then, Scarlett started to feel comfortable next to Benardrick McKinney. On Sunday, he finished with three stops, one quarterback hit, two passes defensed and the first interception of his career. That was one heck of an interception too as it was a scramble drill type of play. Yet, he stayed in the hip pocket of running back Byron Marshall and then made a stellar catch to give the ball back to the Texans offense for another opportunity to score. 14. It was an up and down day for kicker Kaimi Fairbairn. He missed the two field goals, one near the end of each half but he dropped that 54-yard field goal like a champ in the fourth quarter to take the 23-21 lead. 15. On the plane home, I said to my pal Omar Majzoub, PR/Communications superstar, that what was weird and comforting, in some sense, was that the Texans really haven’t played a complete game in all phases yet. When they do, oh boy, look out. 16. On the final offensive drive of the game, Deshaun Watson and the offense faced a third down around the three minute mark. If the Texans converted, they would force the Redskins to burn both remaining time outs. Watson scrambled in the pocket and had a little bit of room to maybe…nope, the Redskins tackled him short by a few yards. He was on the ground, upset that they hadn’t gotten the first. Then, he saw the flag. I watched him the whole time because I saw the flag right in front of me and I knew that he was going to find out at some point. I watched the end of the game on the way to the airport too and when he saw that flag, it was like finding out he had earned an extra life in Fortnite. Or for those in my generation, PacMan had another life. The Texans forced Washington to burn those time outs over the next three plays before the Texans final field goal attempt. 17. Oh, DeAndre Hopkins caught another touchdown? Shocking (not). 18. During Texans Unlimited, our live pregame show, a fan asked whether Jordan Thomas or Jordan Akins would get more targets in this game. Seeing as though Thomas had scored three touchdowns in the last two games, it seemed he would continue to be the guy. But, Akins had been getting open and it was just a matter of time. So, I said as such that I thought it was going to be Akins. He saw a couple of targets yesterday and came up with two important first down catches for 42 yards - one catch for 28 yards and one for 14. 19. D.J. Reader, Brandon Dunn and Christian Covington didn’t get much in the way of stats, but trust me, they were balling out on Sunday. They clogged up the middle throughout the day, holding Adrian Peterson 24 yards under his average (16 carries for 51 yards). c. J-Jo made a perfect form tackle on tight end Jordan Reed for short gain. d. Third and ten, Watt got pressure, Clowney sacked McCoy. The Redskins punted and didn’t see the ball again until there were only 0:52 seconds left in the game. 20. It was classic Texans defense. In fact, the Texans came up with five sacks on the day - one each for each of the pass rushers - Whitney Mercilus, Clowney and Watt. Then, two defensive backs came up with sacks - Tyrann Mathieu and Kareem Jackson. Mathieu is now third on the team in sacks, which is not surprising to anyone, including me who said he would be the fourth best pass rusher on the team when he got here. 21. Mathieu and Jackson finished with nearly identical stat lines - nine tackles, one sack, one TFL, one quarterback hit. In addition, Jackson ended up with a pass breakup. 22. When Keke Coutee is on the field, he’s a handful for defenses. Andre Ware made an astute observation on Coutee’s 40-yard catch and run on a field goal scoring drive. He noted how Coulee knew exactly where the coverage was on him, so when he caught a short pass, he was able to get up field with plenty of room to run and avoid the pursuit. He had the longest play of the day with that 40-yard catch and finished with five catches for 77 yards to lead the team. 23. Dre Hal made a huge play breaking up a potential long completion to Vernon Davis. It was great to see 29 back in the lineup and then to see him make that play was a cherry on the sundae, if you will. Okay, that’ll do it. It’s been a long weekend and trip, so I’m looking forward to three home games during the holidays. Happy Thanksgiving everyone! See you next Monday! 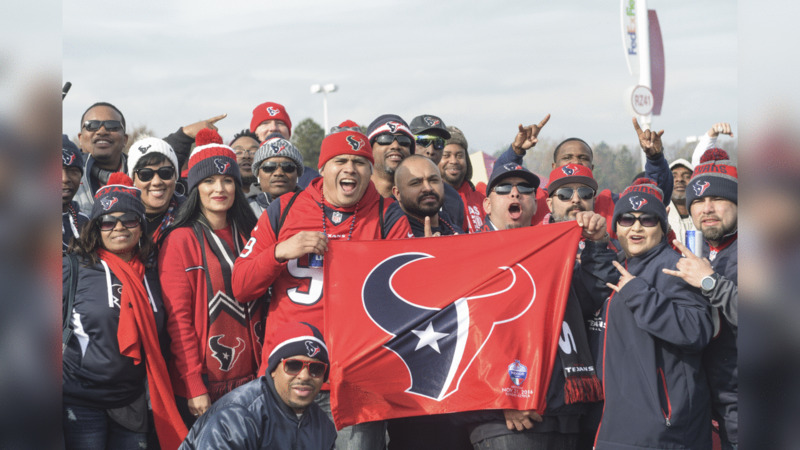 The Houston Texans defeated Washington at FedEx Field with the help of the fantastic Traveling Texans.